This quote is an entry from the end of acclaimed author Steven Pressfield’s latest artistic inspiration book, The Artist’s Journey. Words of wisdom from Pressfield. This entry is one of many powerful entries in The Artist’s Journey. Pressfield uses the template of the Hero’s Journey for artists. Why are artists called to do their art? What is the journey that all artists need to take to pursue their calling? Pressfield returns to familiar themes like The Resistance (as mentioned in his books The War of Art and Turning Pro) and drawing on religious sources like the Bible and Buddhism. Also, he draws on Greek Philosophy and Mysticism to expound on the artistic journey. 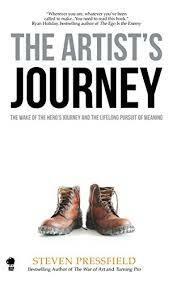 If you like the previously mentioned books: The War of Art and Turning Pro, then you will like The Artist’s Journey. I will admit that when he gets into the mysticism of being an artist towards the end of the book, I got lost. I knew some of that material on a surface level but I did not find it as convincing as the quote that began the post. However, I will recommend The Artist’s Journey for artists (regardless of the artistic medium) to read and apply on their own artistic journey.